Paul Snow, CEO of the Health Care Foundation. Have you or a family member ever spent a night in the hospital? While great attention is given to providing quality care, sometimes the comforts of home can be missed by patients. Paul Snow, CEO of the Health Care Foundation, noticed that while visiting his own family at a hospital in St. John’s. 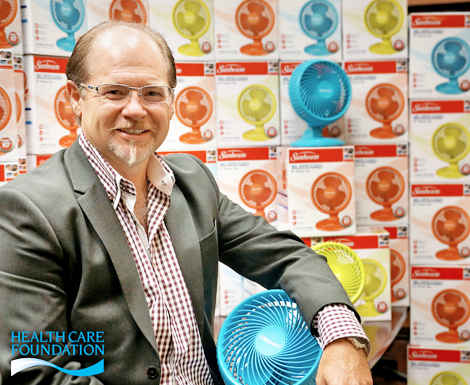 Through the Health Care Foundation’s Comfort in Care ™ program, Paul was able to help facilitate a little relief for patients and staff who were feeling the effects of the record summer heat! While everyone else was enjoying the beautiful, hot summer days, the heat and humidity placed an extra burden on hospital staff and some patients. Paul realized that with a small contribution he was able to help in a big way. Through the foundation’s Comfort in Care™ program, the foundation was able to deliver over 600 brightly colored fans to the five adult hospitals in St. John’s. The Comfort in Care™ program funds items that are not provided through existing hospital budgets. Some of these items tend to be small in nature but make a huge impact on patient comfort, and this impact can be immediate. Florence Walsh, a patient at St. Clare’s Mercy Hospital, with the new fan. 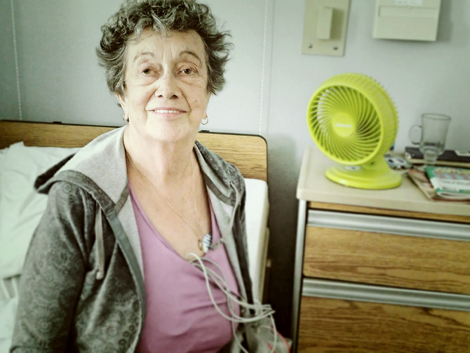 The impact of the fans was felt by various patients receiving care at the city hospitals, including Florence Walsh, a patient at St. Clare’s Mercy Hospital. “The fans are a gift from heaven… I bet you didn’t know you were angels,” said Florence. That’s the wonderful thing about the Health Care Foundation’s donors, they give us wings! Every gift is important. A $20 donation is the cost for a fan—and patient’s smile. Don Keats, interim president and CEO of Eastern Health. Don Keats, President and CEO of Eastern Health, shared the patients’ thanks for donating the fans. Like the Health Care Foundation, Eastern Health also noticed the impact the hot weather was having on staff, patients and residents and worked quickly to implement a number of measures to minimize discomfort and to ensure the safety of patients, residents and staff. In sites with air conditioned areas, cooling rooms were created and staff were provided with additional cooling breaks in many departments. Other measures such as minimizing the use of dishwashers and hot water were also implemented. Eastern Health also provided information to staff on the importance of hydration and staying safe when it’s hot and humid. And, of course, with the help of the Health Care Foundation, Eastern Health placed cooling fans in many long-term care residents’ rooms and in various patient care areas in hospitals! “Eastern Health recognizes the important role comfort plays in the delivery of quality care. We are grateful to the Health Care Foundation for the continued support they have provided our patients, clients and residents through the Comfort in Care™ program,” said Don. SPECIAL TO STORYLINE: This story was written by Danielle Sullivan, development manager of communications and stewardship at the Health Care Foundation.